Designing with aspheres reduces the size and weight of your system. Farview produces aspheres from glass, fused silica, crystals and ceramics for UV, Visible and IR applications using proprietary “grind and shine” techniques for low scatter surfaces. Aspheres have one or more optical surfaces of non-constant curvature. 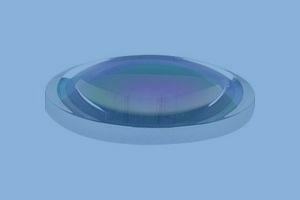 They are used to manage aberrations inherent to spherical lens systems, and to reduce system size and weight. Aspheric lenses have enabled a leap forward in capabilities for medical devices and defense and security. Manufacturing and metrology of complex aspheres is an emerging science for optical fabricators: Farview leads the way in our investment in cutting edge equipment and testing, research and training, and track record of performance on customer programs. Specifying an asphere begins with a custom aspheric form, often fit to the Forbes Q Polynomial or the Even Aspheric Equation . Describing form involves specifying Vertex Radius (I/C). Conic Constant (k) and applicable Aspheric Coefficients (a). Including a Sag Table provides reference information to check correct data entry for each manufacturing or metrology tool used. Farview places tolerances on vertex radius and form error, without tolerances on conic constant or aspheric coefficients. Even aspheric coefficients are preferred.